Enjoy an Aussie-style barbecue dinner with views of Australia’s most recognized natural icon, Uluru (Ayers Rock). Unwind with a complimentary glass of wine as you watch the sun sink over Uluru. Then, enjoy a mouthwatering dinner within the Uluru Kata-Tjuta National Park as a myriad of stars come out to light up the outback’s night sky. After dinner, your outback experience is enhanced with a star tour of the southern desert sky. After pickup from Ayers Rock Resort, you'll travel to the Uluru sunset viewing area. 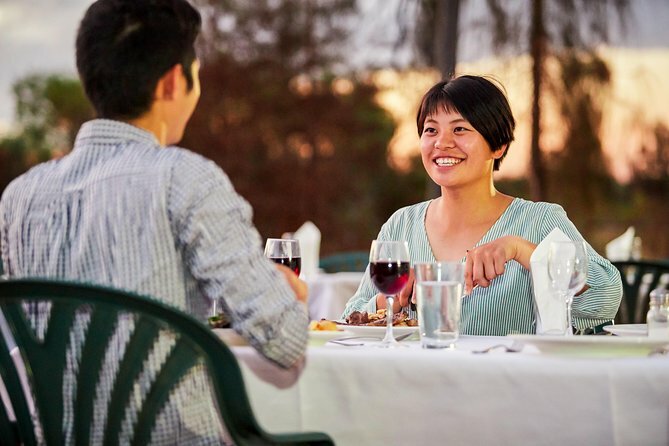 Enjoy a complimentary glass of wine and snacks as the sun sets over Uluru. Continue to the barbecue site located in the Uluru-Kata Tjuta National Park. As you dine looking out across the desert to Uluru (Ayers Rock), savor the mouth-watering flavors of a traditional Aussie barbecue. The menu includes sizzling gourmet sausages, a delicious selection of meats, seasonal salads and fresh bread rolls accompanied by a complementary selection of wine, beer and soft drinks. After dinner, relax with a cup of tea or coffee as the sun gradually sinks below the desert plain to reveal a myriad of stars in the outback’s spectacular night sky. The Ayers Rock desert is one of the best places on earth to view the southern night sky. Your local guide and star expert will lead you through the constellations and planets as they move about the sky. Discover the zodiac constellations, find south using the Southern Cross and be amazed by the gleaming Milky Way. This is an experience not to be missed. Had a lovely evening at the BBQ and Stars dining experience. Food was delicious and very well organised. Just a shame it was cloudy and never got to experience Uluru changing colour in the sunset. But we’ll worth going. Absolutely wonderful! Brilliant views of Uluru as the sun set, with plenty of snacks and drinks including champagne while we watched. Then on to the Outback Barbecue which was amazing. Loads of food, all well cooked and plenty to drink. Highlight was the lights out when we were pitched into absolute darkness while the resident astronomer explained the night sky. Did this on the first night, so there is plenty of time to do this after arriving in our case from Sydney. Do not miss this experience, once in a lifetime! Uluru is incredible and having a delicious dinner in view of it and seeing how bright and clear the stars are was amazing. Highly recommend to really get everything out of your trip. I would recommend this outing. Sunset experience, accompanied with wine, was out of this world. Followed by BBQ dinner which was delicious and had Kangaroo, as the local option, along with the more traditional BBQ meats chicken, steak and shrimp. There were side dishes, more wine, beers and juice. The stars were amazing and the Star glazing chat was nice. At the dinner table you get to mingle with Australian and International tourists which makes the whole experience even more rich. The only draw back for me was that I wanted a longer Star glazing chat since it was one of the reasons why I went out in the middle of Australia to experience, beside exploring Uluru. This is still a must tour for anyone interested in the outdoors, stars, constellations and good food. The Tour started with a trip to see the rock at sunset which was interesting. However afterwards we went to the Barbecue dinner which was a sham. All they did was taking us to an extremely overpriced dinner There was nothing unique about it. U can eat better in any restaurant in Uralo. Big disappointment. Also the star gazing was not very interesting.